"Sorry for the loss of your loved one. Please find peace and..."
Rodney Max Radford, 89 of Glenwood, passed away March 23, 2019, at his home in rural Glenwood. He was born on June 14, 1929, in Glenwood to George and Winnie (McDole) Radford. Rodney graduated from Glenwood High School in 1947 and was honored his senior year to be Homecoming King. Rodney was united in marriage to Betty Louise Jones on Jan. 25, 1953, in Malvern. To this union three sons were born, Rodney, Jr., Randall and Reginald. Following high school, he was employed with the Corp of Engineers. He then became a line foreman for Iowa Power and Light which is now Mid-American Energy. Rodney was a member of the Army National Guard for 35 years. 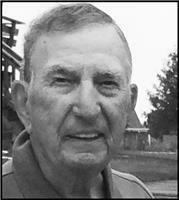 He was also a member of Lions Club, Fraternal Order of Eagles, and 62-year member of I.B.E.W. Some of Rodney's passions were gardening, traveling, fishing, bowling and building bird houses. He was a devout Hawkeye and Kansas City Chiefs fan. Rodney was a true family man in every sense of the word. Preceding Rodney in passing were his parents, wife Betty in 2006; siblings, Duane, Charlie, Harold, Freda, Betty and Wanda. Survivors include his sons, Rodney Max Radford, Jr. (Becky) of Glenwood; Randall (Sheri) Radford of Arvada, Colo.; Reginald Radford of Glenwood; four grandchildren; seven great-grandchildren; two great-great grandchildren; extended relatives and many friends. Visitation is Wednesday, March 27, 2019, from 10 - 11 a.m. at Peterson Mortuary. Services are Wednesday, March 27, 2019, at 11 a.m., at Peterson Mortuary. Interment is in the Glenwood Cemetery.